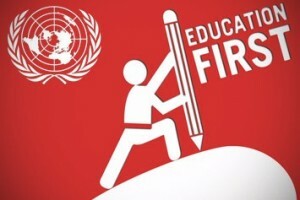 For the first time, a UN Secretary-General has made education a priority during their tenure. The education in emergencies community was deeply heartened and encouraged that education in emergencies was included in the strategy as one of the 10 commitments made by the General Secretary: “Sustain education in humanitarian crises, especially conflict.” At least half of the 61 million out-of-school primary school-aged children, and millions more out-of-school cheap jerseys youth, are in situations of conflict or natural disaster; recognizing this problem is critical to ensure all children cheap nfl jerseys have access to safe, quality, relevant education. Education is a human right. That right is not suspended during crisis or conflict. It is not negated because a child is born in an area of conflict, or in an area where flooding or earthquakes take place. Given this lifting up of education in emergencies, the education in emergencies community is coming together to create an advocacy campaign to ensure that actions are immediately undertaken to guarantee the commitments and call to action are realized. Education cannot wait. Our children cannot wait. How will you and your organization/institution support the Education First and Education Cannot Wait initiatives? Lori, at a time when some of the leading donor countries are confronting major economic problems, it is important to keep the issue of education at the forefront but given the present economic crisis in the west it is important to see how education also relates to economic growth and we need something far more sophisticated than human capital theory for that!